Child’s Play has been used in schools and yoga centers throughout the US. 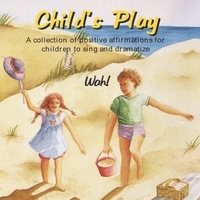 The CD and accompanying booklet draw on American Indian folklore, yoga, East Indian philosophy, and martial arts to create songs and activities for children ages 3-8. The booklet has easy to follow diagrams that outline a variety of hand-dances, games and activities which can be done to the songs. I taught yoga to children for about 10 years at a summer camp for young children (ages 3-10). This CD and booklet is a result of our combined exploration of yoga postures, breathing, and meditation. I brought the songs and games into school programs as well, finding success in the Kindergarten, 1st and 2nd grade classrooms. What I didn't expect was its effectiveness in the special education classes. Children with learning disabilities and special needs showed marked improvement after practicing the simple exercises and singing the songs. I created this booklet to share the way in which I introduced the concepts, songs and games into the classroom. The photos you see on the back cover are from special education and regular classes in New Mexico public schools. Children's yoga has since been integrated into many public and private school curriculum throughout the US, and it is wonderful to see so many children enjoying this practice. Wah! has a BA from Oberlin College/Conservatory in Performing Arts and Music (1979) and an education degree from Fairleigh Dickinson University (1981). In addition to Western music training, she has travelled and studied music and dance in Africa and India. Her training in yoga, education, and music allows her to bring a unique and uplifting experience to young audiences.